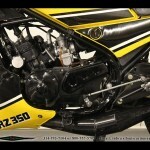 Seeing Double: a pair of Kenny Roberts Yamaha RZ350s! It’s really hard to miss these bumble bee yellow RZs. 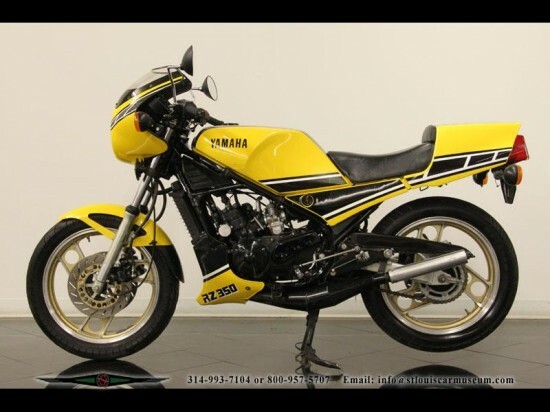 With their bright Yamaha / Kenny Roberts graphics and twin cylinder, 350cc two stroke engines and boy racer good looks, they continue to be very popular on this site and over on RSBFS. Here we have not one, but TWO nice examples of the breed. 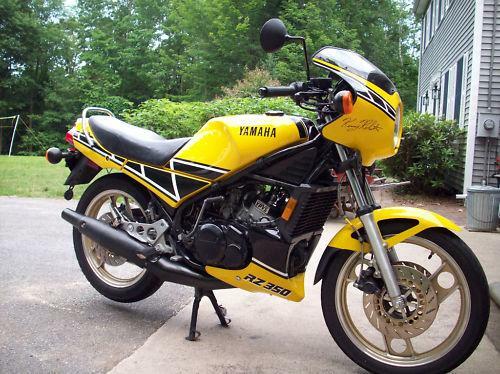 This ’84 model bike is very clean, and looks to be quite original. It still has the original exhaust system, which has catalytic converters hidden in the exhaust pipes to help it squeek past the EPA. Those pipes are heavy and far from the optimal expansion-chamber shape for maximum power, so they are usually the first casualties when the modification man comes to visit. 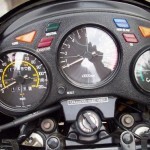 The bike has 17k on the odometer – which is more than we usually see on these bikes – but the condition is such that one wouldn’t really notice it; the cleanliness speaks for itself. 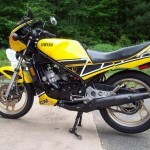 This is a clean original 3 owner1984 Yamaha R350 Kenny Roberts Edition in excellent condition with 17,490 miles and runs excellent. This bike is in 99.9% OEM condition, the only parts not OEM are the stainless steel braided lines, the carb vent hoses, fuel lines, a fuel shut off, and the “warning” sticker is missing from the wind screen. The carburetor was completely rebuilt with new internal parts including OEM metal reed valves, floats, hing pins, needle valve sets etc…. In addition to this, all of the coolant lines have been replaced, the rubber inserts in the foot pegs were replaced, I replaced the handle bars because the black coating was rubbed off, the rubber on the kick start was replaced, and any clamp or screw that was not perfect was also replaced. All replacement parts were Yamaha OEM parts and I have ALL of the parts that I took off the bike. The power valve controller along with the ignition module both work flawlessly. The bike speaks for itself. This bike runs strong and the engine has not been rebuilt. 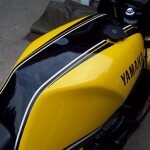 Every cable and hose is run properly per the Yamaha OEM spec and every zip tie, hose clamp, rubber bands, vent hose, etc is run per the Yamaha OEM specification. The fairings look beautiful, the tires are near new with virtually no wear. I will also include a 3 ring binder with the Yamaha micro fiche copied for this bike, the original manual under the seat, and the Yamaha Factory Service Manual. The flaws: the coolant lens on the dash has 2 small cracks in it, the paint around the brake master cylinder is partially missing from coming in contact with the fluid, there are 3 small paint chips in the gas tank (one on each side and one on the top). 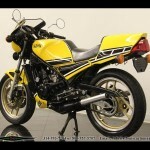 The second RZ today is also a yellow/black model, but is from 1985. Not much changed on these bikes over the 2-year span of their existence in the US, but this bike is a little different than the first. 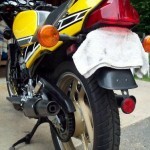 Note the aftermarket exhaust system, which places the bike in a higher state of tune. 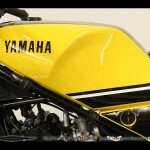 If done correctly, the carbs will have also been re-jetted to take advantage of the pipes’ breathing ability. 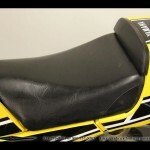 Note also that this one has a solo seat cover, which does give the bike a more sporting look. The bike we are offering here came from a collector in his early 60s. He never raced the bike and always kept it out of the elements. 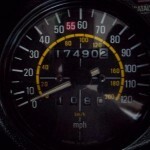 It has 12,000 miles on it and runs and rides magnificently! Cosmetically it is beautiful. There are some small paint checks under the decals (very common for these). These are getting impossible to find that haven’t been trashed. Great investment! This bike also looks great. The expansion chambers are a period correct modification, and really make a substantial difference in power. 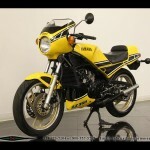 The solo seat was a factory/dealer available option if I recall correctly, and enhances the bike’s looks and value. This one also has some engine curiosities, however. 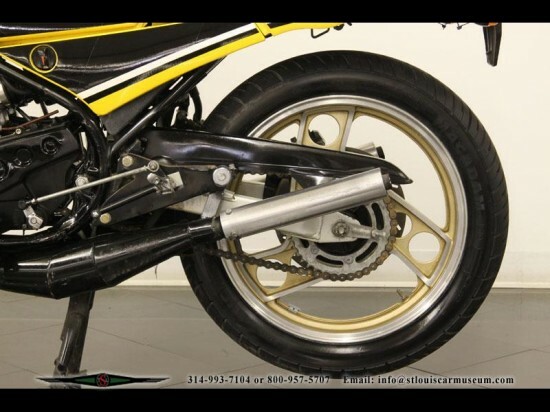 Note on this ’85 bike the engine is painted entirely black – which is how it came stock – but the head has also been painted black. Normally, there is a white rectangle with the letters “YPVS” (Yamaha Power Valve System) in black, but here they have been painted over. Again, this points to a possible top-end rebuild somewhere along the line, although not a guarantee. Those interested should contact the seller directly for more information. Since these were not terribly expensive machines, most of them have been thrashed within inches of their lives. It is nice to find two great examples still around. Prices are definitely on the rise for these little screamers, so if you are in the market to collect one this might well be your chance. Good luck and don’t forget to stock up on 2-stroke oil!! !